How does he think them up? Who's the greatest author's friend on the planet? 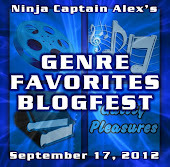 So many questions and I can't answer the first one, but author of the successful SF Cassa series is the answer to the second: yes today Alex J. Cavanaugh is hosting the Genre Favorites Blogfest. Not difficult did I say? That's like asking where my inspiration comes from...chorus time...I don't know! Carlos Fuentes could have been talking about me when he said: "Don't classify me, read me. I'm a writer, not a genre". Let's start with movies, or films (ahem), because it's the easiest one. I like comedy. For example, I adored Peter Sellers in all "The Pink Panther" films . Here's a snippet from one if you want a laugh: "Does your dog bite?" That was easy. Now onto the difficult part. All over the place, that's me. I think cheesy movies from one era or another will wind up on a lot of lists. Thanks for the great intro and participating in the blogfest, Susan! Cheesy movies made me smile. We all need our guilty pleasures. My post won't be up until the morning. Saying hello from the blogfest. I enjoyed To Kill A Mockingbird and have heard good things about The Night Circus- that's on my to-read-someday list. That's the first "carry on" reference I've seen so far! cheesy is what it's all about! haha i loved your list! GOOD choice in films. I love that whole nudist camp sequence in Shot in the Dark, OH and the bit with the parallel bars and the stairs and the suit of armour! Just brilliant. I sometimes like comedy...I could always go for a good laugh when I need it. There's a lot to be said for cheesy. Especially British cheesy. I LOVE Damien Rice. But, I have to admit, I am the only person in the world who didn't love The Night Circus. The descriptions were beautiful and awe-inspiring, but the rest of it fell a little flat for me. I never felt like I knew the MC's well enough to buy into their romance. But, that's why we have so many different books, right? Cause not everyone likes the same things. Anyway, love your site. The little cat threatening me to leave a comment was enough to make me into a follower. haha. Nice to meet you! Carry On . . .I haven't seen one of those in a long time . . .sounds like fun!